The 1940s Dairy Cottage has two double bedrooms and two bunk rooms and can accommodate 11 people. We spend a morning pulling vainly at the sausage-like extractions on Zynya, a nine-year-old, off-white cow at the Cedar Glen Farmstay, 90 minutes from Brisbane, Australia. The day had begun with relative success. Ten of us from two families on the ranch had strolled on its undulating grass-gravel grounds, feeding a succession of hungry animals. First, a clutch of chickens, including the unidentified miscreants who had woken us two hours ago. Then, a herd of salivating sheep that rushed towards us, causing Amaia, my two-year-old niece, to take cover behind her father's calf. We meet the Muscovy ducks, a large, boisterous species native to Central and South America, whose elongated beaks fire away at the food in our white Tupperwares. "They're like machine guns," warns our host Nigel Stephens, whose guidance is pitch-perfect for urban ignoramuses like us. Car rentals at Brisbane Airport range from less than A$30 (S$30) a day for a compact car to A$100 a day for a seven-seater (www.vroomvroomvroom.com.au). Depending on the cottage, prices at the Cedar Glen Farmstay (www.cedarglen.com.au) range from A$240 to A$330 a night for two adults and two children on a self-catering basis. An additional adult is A$55 and an additional child is A$30 a night. Different meal plans are available on request. Other notable Queensland farmstays include Clandulla Cottages (www.clandullacottages.com.au), Lillydale (www.lillydale.com.au) and Tommerup's Dairy (www.tommerupsfarmstay.com.au). The feeding ends with two seven-month-old pigs, which, to our surprise, have a penchant for grunting, not oinking. Finally, the milking. In the shed, Zynya's right hind leg is roped to a pole, while a thin chain, glinting in the morning sun, is strapped around her hamstrings. She seems unbothered that humans have chained and started fondling her because she is distracted, having dunked her head in a broad receptacle where breakfast, a grain mix, awaits. The Cedar Glen Farmstay (www.cedarglen.com.au), one of several near Brisbane, traces its roots to the late 1800s, when Edgar Stephens, Nigel's great-grandfather, decided that Brisbane city life was not for him. He started buying parcels of land in an area known as the Lost World, on the outer edges of what is today the Lamington National Park, a sprawling, pristine sub-tropical rainforest. There, he started a dairy farm and, in 1901, built a homestead where he and his wife Mary Ellen raised 10 children. Over the course of the 20th century, the ranch grew then declined. Following his death in 1941, the property was progressively carved up among his descendants. Most returned to the city. What is left today is a farm on 425ha - slightly larger than Marina Bay - in a valley of rolling green hills, ringed almost entirely by low mountain ridges, on top of which rows of trees stand at attention. Here, a coterie of domesticated species, including a herd of purebred Arabian horses, co-exist alongside innumerable wild ones, including kangaroos and birds such as rosellas, robins and whistlers. The only time Mr Stephens, a 42-year-old agricultural major who has lived entirely in the country, is dumbfounded is when I ask him to identify all the birds. Every dawn and dusk, we stop and look above, as a flock of white cockatoos migrates from one end of the sprawling ranch to the other. The 4km from the farmstay to the entry gate of the Lost World section of the Lamington National Park is a gradient from relative civilisation to wilderness, allowing visitors to easily bridge the divide between humans and other species. While Amaia talks to the pigs and rides on a pony, my mum, younger sister and I go hiking. The forest's diversity bewilders us. There are hoop pines, eucalyptuses, she-oaks and the occasional shock of yellow or pink lantanas. We spot enchanting green goblets bouncing waist-high in the wind - not poppy, but wild cotton bolls, which will eventually burst, exposing their familiar white fluff. After an hour and two river crossings, we realise the forest has thickened, the light dimmed and the moist path narrowed. We know our time in the Lost World is up when we see a safety sign: "Are you carrying a topographic map and compass? "; "Do you understand that a search will not usually be started until you are 24 hours overdue?" On the return hike, my sister slips while crossing the river, bruising one ankle and losing her espadrilles. Three of the four cottages at the Cedar Glen Farmstay are part of the original homestead. The six of us, including Amaia, are in the 1940s Dairy Cottage, a delightful green-roofed abode on stilts, whose two double bedrooms and two bunk rooms together accommodate 11. It has been minimally renovated to achieve a fine balance between rustic, clean and modern. The beds are inviting and the electrical sockets are accessible. There is an abundance of hot water in the shower and drinking water in a dispenser. The oak floorboards creak gently when we walk. The ageing white gas oven and stove take some getting used to before performing gallantly. The homeliness is fostered by books, board games and quirky black-and-white photographs on the cream wooden walls, which show a bygone era of different social mores. Thankfully, the farm stay is not, as I had feared, some zoological prison. The cottage itself, the solitude and the inspiring 360- degree views are sufficient for a few therapeutic days away from the grind. In the evenings, my mum shuts herself away with a book. I stand in the patio, nursing my Scotch, while the cool wind caresses my ears, listening to the odd Arabian horse harrumph. My younger sister stands under a large tree 10m from our cottage, her face illuminated by a screen, ecstatic at having found the point of peak mobile-data coverage. For A$2 (S$2) a day, you can surf the Internet on your mobile phone using a pre-paid card bought at the Brisbane airport. Getting to Cedar Glen from Brisbane is easy. 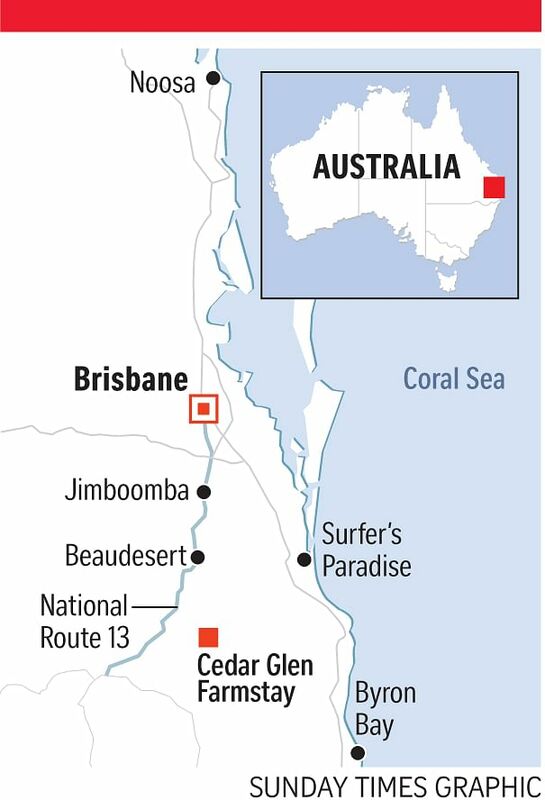 A 90-minute drive takes us out of this city of two million people, then onto a multi-lane motorway and, finally, National Route 13, which narrows to a single lane slicing through dairy farms and glistening expanses of wheat, passing towns with names such as Beaudesert and Jimboomba. Having read poor reviews by Singaporeans of Cedar Glen's catered food on TripAdvisor, we first visit the Eagle Farm Markets in Brisbane. Like other farmers' markets that have proliferated in the West, it offers everything from heirloom vegetables to fresh meat to the latest local attempt at fusion cuisine. We leave with a stuffed cooler bag, the highlights including a whole 2.6kg Australian wagyu tenderloin for A$106, which is good for five meals; and a Moreton Bay Bug, a slipper lobster that looks like a cross between a crayfish and a regular lobster. Yet, our gastronomic fears are overblown. The one meal from Cedar Glen, a picnic lunch by a creek, is sumptuous. After our swim, we dry off to find Mr Stephens ready with three flavours of sandwiches - beef, egg curry and chicken - and a surprising corn quiche that is the first to go. We end with carrot cake, strawberry pie and hot tea. For a day, I have been biting my tongue, but now, I finally channel my inner Singaporean. "Can we eat any of the farm animals?" "Yes, the beef in the sandwiches, the eggs, some milk we got this morning - that's all from the farm." Earlier, Mr Stephens had prevented us from drinking Zynya's fresh milk because of strict pasteurisation regulations. But it is permitted when cooked in the quiche. The end of March, as it turns out, is a perfect time to visit Cedar Glen. The burning summer is long gone, yet the winter crowds have yet to arrive. The farmstay is busy in June and July, when lows of above 10 deg C attract Australians escaping harsher climes elsewhere. It is also a good time for tourists from China, Malaysia and Singapore to visit because of the school holidays. It is a rather long journey from Singapore to visit Brisbane just for a few nights on a farm. But that is why Brisbanites love their city. Within a two-hour drive, one can reach wine country inland, the untouched splendour of Noosa up north, or world-famous Surfer's Paradise and bohemian, chic Byron Bay to the south. A farm stay, then, should ideally be part of a week-long Queensland jaunt. For Singaporeans, farm stays are all part of a renewed interest in agriculture and food supply. In recent years, however, there has been a stirring of animal, environmental and food consciousness in Singapore. Edible gardens, heritage grains, farm-to-table and terroir have evolved from pretentious cliches to genuine concerns. Yet, there is still some way to go. After we have milked Zynya, Mr Stephens takes over. His hands shake up and down, alternating with the smooth synchronicity of a maracas player. He fills half the bucket in under a minute. "Is it strength, technique or rhythm?" "All of the above," he says with a shrug. • Sudhir Thomas Vadaketh is the author of Floating On A Malayan Breeze: Travels In Malaysia And Singapore. Read his blog at sudhirtv.com.